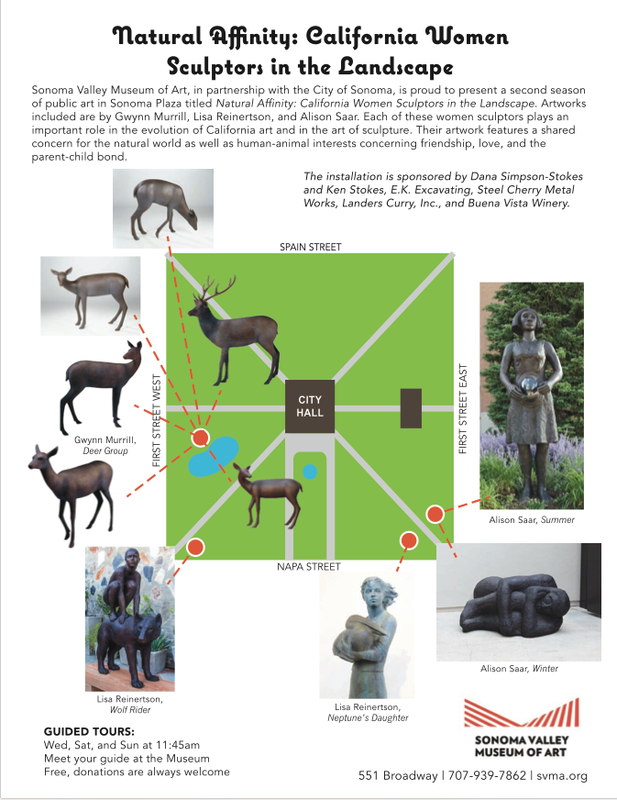 Sonoma, Calif. – May 30, 2018 – The Sonoma Valley Museum of Art is proud to present a second season of public art in Sonoma Plaza this summer. Natural Affinity: California Women Sculptors in the Landscape opens June 8 and runs through October 21. Artworks included are by Gwynn Murrill, Lisa Reinertson, and Alison Saar. Each of these women sculptors plays an important role in evolving the canon of California art and in the art of sculpture. Their artwork features a shared concern for the natural world as well as human-animal interests concerning friendship, love, and the parent-child bond. There will be opening remarks by representatives from the Museum, City of Sonoma, and the artists on June 8, 2018 from 5:30-6:30pm in Sonoma Plaza and a public reception on the Plaza from 6:30-8pm where guests are encouraged to bring-your-own picnic. The installation is a partnership with the City of Sonoma, and is supported by Dana Simpson-Stokes and Ken Stokes, Steel Cherry Metal Works, E.K. Excavating, Inc., Landers Curry, Inc., and Buena Vista Winery. Tours exploring the exhibition will be offered on Wednesday, Saturday, and Sunday mornings at 11:45am. Visitors can meet the guides at the SVMA museum front doors and walk over to the square. Public art tours are free and donations are always welcome. Reinertson’s public art can be found in Riverside, CA; in Sacramento, CA; near Almaden Library in San Jose, CA, among many more; and is in public collections of the Crocker Art Museum, the ASU Museum, and the Mint Museum. Gwynn Murrill has public commissions at the San Francisco Zoo; the Embassy of the United States of America, Singapore; U.S. Bank Plaza, LPT Associates, Sacramento, CA; and is in the public collections of LACMA, CA; Milwaukee Art Museum, WI; and Palm Springs Desert Museum, CA, among others. Saar’s artworks can be found in Madison Square Park, New York; Hall of Justice, Los Angeles; Laumeier Sculpture Park, Missouri; Harriet Tubman Plaza, New York; in the collections of the Hirshhorn Museum and Sculpture Garden in Washington D.C.; Walker Institute in Minneapolis; the Whitney Museum of American Art in New York; and the High Museum in Atlanta, among others. The Sonoma Valley Museum of Art announces its participation in the ninth annual Blue Star Museums, a collaboration among the National Endowment for the Arts, Blue Star Families, the Department of Defense, and more than 2,000 museums across America to offer free admission to the nation’s active duty military personnel and their families from the Saturday of Memorial Day weekend, May 26, 2018 through Labor Day, September 3, 2018. The free admission program is available for those currently serving in the United States Military - Army, Navy, Air Force, Marine Corps, Coast Guard as well as Active Duty and Reservists, National Guardsman (regardless of status), U.S. Public Health Commissioned Corps, NOAA Commissioned Corps, and up to five family members. Qualified members must show a Geneva Convention common access card (CAC), DD Form 1173 ID card (dependent ID), or a DD Form 1173-1 ID card for entrance into a participating Blue Star Museum. The Sonoma Valley Museum of Art is located at 551 Broadway, one half block up from Sonoma’s historic Plaza. Regular Museum hours are 11am–5pm Wednesday through Sunday. 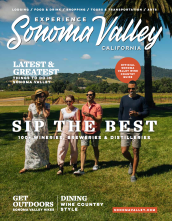 Admission is $10 for adults, $7 for Sonoma residents and free on Wednesdays. Students K-12 are admitted free, as are SVMA members. Additional information is available at www.svma.org or by calling (707) 939-7862.